The Flash moves away from the alien craziness last week and returns to handling its own problems. Revealing that Alchemy is actually Julian under the mask two episodes ago was a really boring and predictable twist that made the world this show inhabits feel hilariously small but this episode does some work to make this count and mine some legitimate drama from it. I like the idea that Julian has no idea that he has been moonlighting as a villain granting people powers because it removes most of the accountability from him. Julian is a character who can be redeemed since he wasn’t in control of his actions. Of course he’s still really unlikeable and I doubt anything will change my mind on that but this reveal allows the character to continue in the capacity he was introduced relatively unhindered. This also presents the opportunity to provide some backstory for Julian as well. It’s a tragic one because is there really any other kind? It also happens to be one that explains the reasons for him becoming Alchemy. 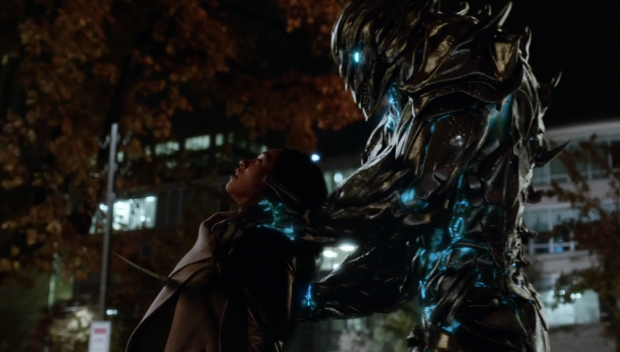 Being consumed by grief after the loss of his sister and breakdown of the relationship he had with his parents makes him a prime target for Savitar’s influence which plays out well enough. 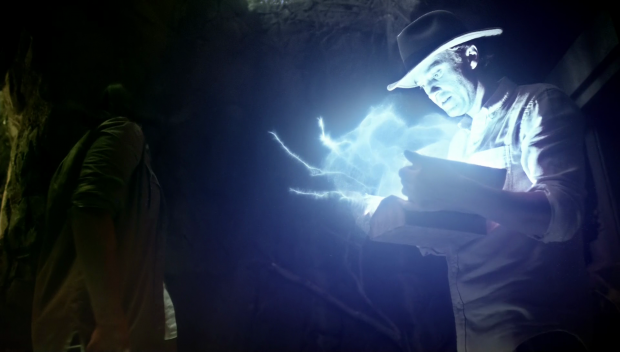 The Indiana Jones style opening where he finds the stone -cunningly referred to as the Philosopher’s Stone to give us a cheeky Harry Potter reference- was good enough and shows that the stone itself has an effect on whoever happens to pick it up. It’s a cursed object that can be passed from person to person so the identity of Alchemy doesn’t really matter. I also liked how this pays off by Cisco experiencing visions of his dead brother urging him to pick up the stone and allow Savitar to manifest. For whatever reason he is linked to the stone and it has to be out of his box to allow him to manifest. It’s an interesting little mystery that adds a much needed extra angle to Savitar. Come to Earth-3, we have Zeppelins! Having the identity of Alchemy be something that doesn’t matter presents an opportunity for the character to return without worrying too much who is behind the mask. Cisco almost became the next Alchemy when he succumbed to Savitar’s influence so I imagine that another version of Alchemy will appear in the future and I’d like to see the show play with the corruption of an unknown innocent person rather than someone close to the characters. Julian is the latest to be let in on Barry’s secret and the unmasking works because Julian is completely unwilling to trust the Flash. I can see his point considering from his point of view he was locked up in a strange place for no reason. Putting villains in the pipeline has always been illegal and that’s one thing the show has never lost sight of. Julian being locked up in there is a violation of his rights and his reaction makes sense since he doesn’t know why he’s in there. Barry actually approaches this rationally and realises that Julian needs to see the face of someone he could trust. He does try the blind accusations and that doesn’t work so the mask coming off is what he does next. I like that it all clicked for Julian after that point since the inkling that Barry could be the Flash must have been in the back of his mind if he is as intelligent as the show tells us that he is. It’s also good that the trust after the fact isn’t unconditional since he still doesn’t really like Barry. I must admit that I was surprised that he didn’t threaten to expose Barry but that’s probably just a personal expectation. The best scene in the episode was Savitar speaking through Julian. He is a physical threat but up until this point there hasn’t really been anything else to him other and this scene gives us a little more information while preserving the mystery. The idea that he is from the future and feels personally wronged by Barry because of something he will do in the future. It does feel reminiscent of the Reverse Flash connection from season one but the “One shall betray. One Shall Fall. One shall suffer a fate worse than death!” promise that he drops adds an important difference. Having that knowledge is something that Team Flash will dwell on from now on and might even cause by attempting to make sure that it doesn’t happen. There isn’t much to go on at this point in terms of predicting what will happen but I’ll give it a go. My money’s on Wally being the one who betrays even though he gets the acceptance that he wanted in the form of a suit and being officially named as Kid Flash. It could be that Barry is an ineffective mentor and causes him to go down a really dark path. It could also be H.R. since specific reference was made to the “Fake Wells” which lines up with what we already know about him but there could be a further reveal that he is hiding something and I think it will have something to do with the face camouflage tech that he uses. Iris could be the one who falls considering Barry is flung into the future and sees Savitar killing Iris right in front of him. This could be a massive red herring but their relationship is progressing to really serious territory so that kind of loss would resonate with him. The fate worse than death would obviously be Barry who will have to deal with the death of someone close to him as well as confronting his failings as a mentor. These could all be wrong but I’ve had a go and I’ll revise my theories as we go along. Is Savitar a good villain yet? To my mind he still has a long way to go but is heading in the right direction. His connection to the stone adds a limitation keeping him from being all powerful and the intimate future knowledge he has gives him enough of a personal connection to the team to keep the threat urgent. There’s a lot of work to do on him but I’m impressed with the teases so far. Even though the Julian part of the story was handled well the Alchemy part could have used some polish. Up until this point Alchemy has been very deliberate in the way he goes about carrying out Savitar’s plan so having him attempt to give everyone powers at once feels a little jarring and contrary to the plan before. It feels like the writers wanted to get this out of the way to develop the Savitar plot so rushed it along. 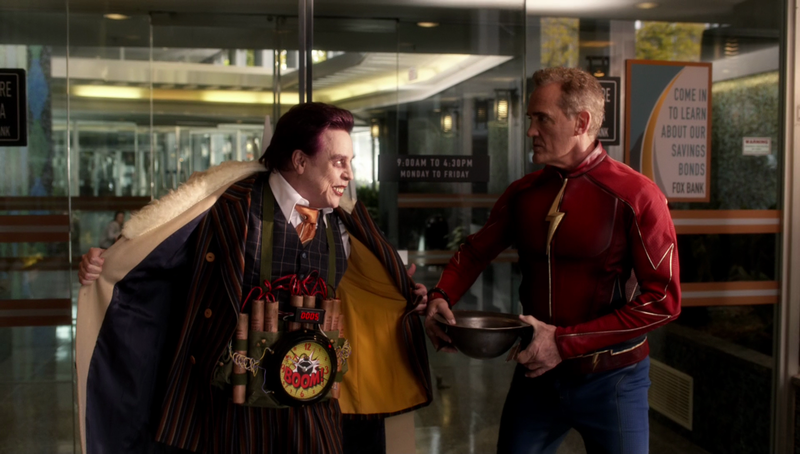 Barry teaming up with Earth-3 Jay Garrick was a really nice idea that was really well executed. John Wesley Shipp plays Jay as a different man to Henry but there are definite similarities. The overall decency and sense of wellbeing are the same in both characters. His relationship with Barry is very different to the relationship between Henry and Barry for obvious reasons. Barry still feels awkward about this other Speedster looking like his father and Jay doesn’t seem comfortable being a mentor. This dynamic adds a certain weight to their scenes together that makes them a lot of fun to watch. They feel connected through their status as Speedsters and Jay has more experience to bring to the table but there is always going to be that distance between them that neither of them can really move past. Seeing them team up was great as well and Jay’s fight with Savitar was appropriately brutal. Barry and Jay aren’t ready to take on Savitar yet and there’s genuine peril in Jay finding himself completely at Savitar’s mercy. The best scene involving Jay was his advice to Barry on the future. Barry’s go to position is to change the timeline if he feels that something bad is going to happen but Jay reminds him that there’s no point in second guessing himself because every choice he makes creates a new set of possibilities. The voice of experience has a lot of weight behind it and Barry clearly needs to hear about this to get rid of his urge to change the timeline every time something bad happens. Unfortunately he neglects to tell Iris or the rest of the team what he saw which is really frustrating considering how dishonesty has poisoned relationships this season. One thing is definitely clear, Barry needs to stop worrying about the past and the future because he needs to keep his mind on the present. Jay knows this and Barry needs to realise this but I predict that he will end up causing events to play out the way he saw them through trying to prevent them. Having Jay around also allowed us a brief glimpse at Earth-3 and it has Zeppelins! 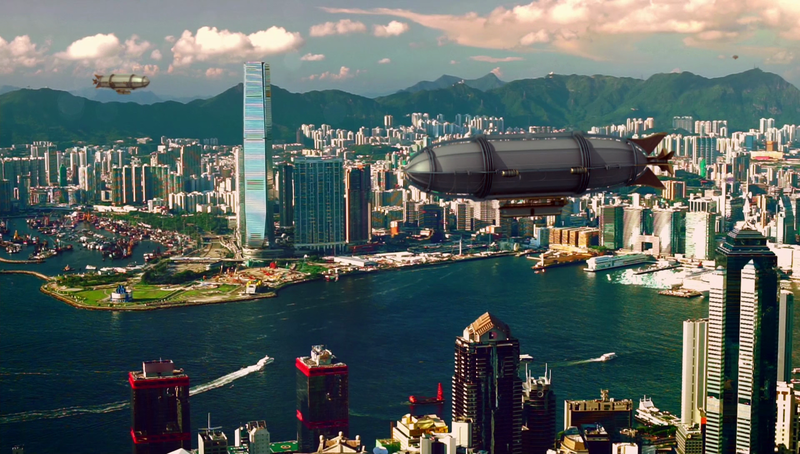 Alternate realities don’t feel quite right to me if Zeppelins aren’t involved so I was personally very excited by this. We also get to see the Earth-3 Trickster which was great. This is probably about as close as we will ever get to seeing Mark Hamill play the Joker. It’s a shame that he was only around for one scene but there’s no way that he could have faced the combined might of two Flashes so it was probably for the best. Maybe an entire episode set in Earth-3 would be fun but I enjoyed the tease that we got. This episode also allowed us to experience what The Flash does best. The Christmas party scene was great as it allowed the characters to unwind and simply enjoy being around one another. It feels like it has been a while since this happened and it’s long overdue. It has been proven time and time again that the world doesn’t need to be in danger for these characters to be engaging. There were a lot of great moments such as H.R. getting drunk on very strong Eggnog, Caitlin pushing her fears aside and letting them have a White Christmas and Joe finally getting together with Cecile to the delight of his family. Everything about this was so warm and fun and the contrast with the melancholic mood pretty much everyone was in made it feel more necessary. The episode ending on Iris and Barry moving in together wasn’t the strongest but I’ll give it a pass considering how good everything was up to that point. See you all in January for more reviews of The Flash. A really engaging episode that built Savitar up as a threat while doing something interesting with Alchemy. Julian turning out to be Alchemy is a really obvious twist but this episode made the best of it by distancing Julian from his alter ego. The blackouts and lack of knowledge means that Julian is redeemable and opens the door for Alchemy to return as anyone else in the future. 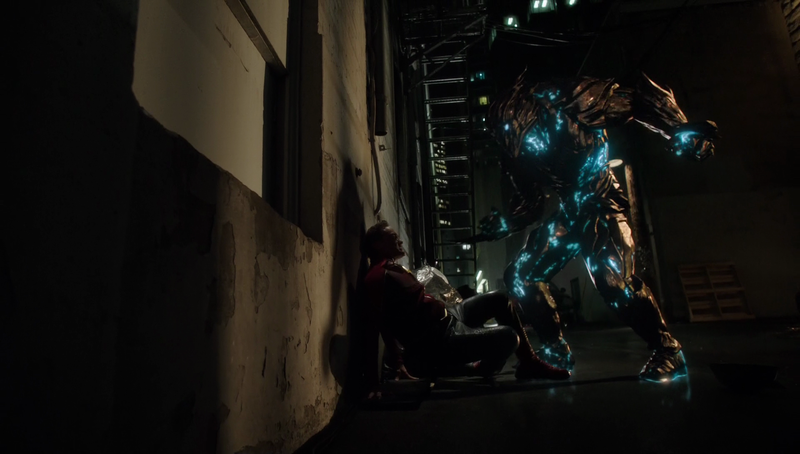 Savitar is the biggest threat and the way he gives vague promises about the future of Team Flash while revealing that Barry caused Savitar to go for them was fairly chilling and helped add a more personal connection. He isn’t a great villain yet but is certainly getting there. Having Jay Garrick back was most welcome as was the look at Earth-3 and its version of the Trickster. The relationship between Barry and Jay is really interesting as there is a tension caused by Jay looking like Henry. His advice on focusing on the present rather than the past or future resonates because of his experience and I doubt Barry will heed it. The Christmas party scene felt long overdue as it has been a while since the characters simply got to unwind and enjoy being around one another. 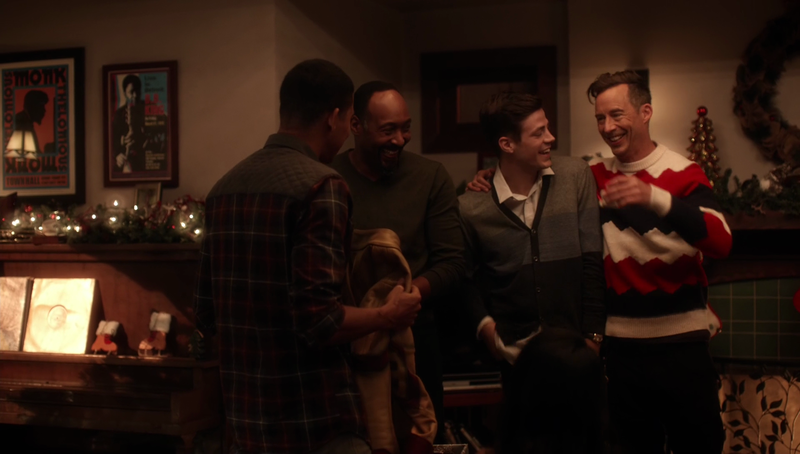 These scenes are what The Flash is best at as a show and there should be more of them. It was full of great moments and the fact that everyone was in a fairly sour mood made it feel more necessary.